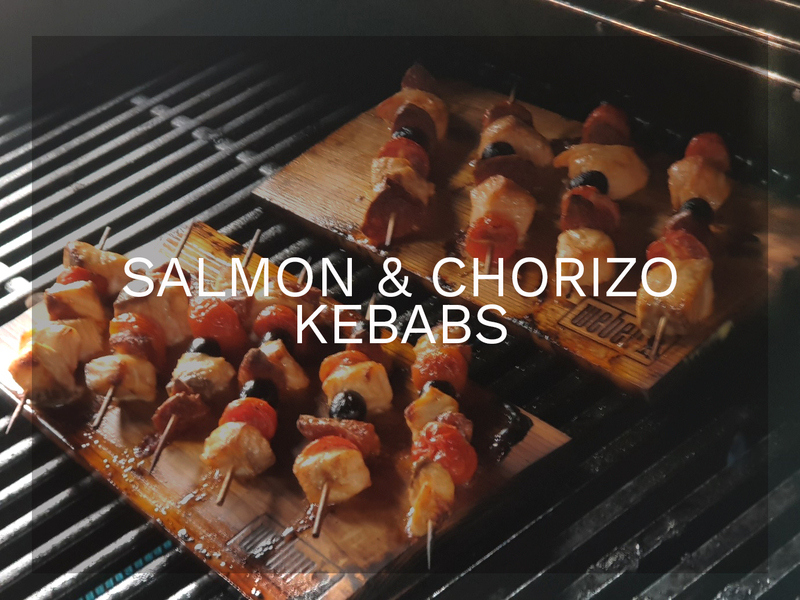 These Salmon and Chorizo Kebabs are perfect, whether your entertaining guests or just having a little family BBQ, these kebabs are easy to do and have a lovely smokey taste. Soak the Weber Cedar Planks in water, ideally overnight to get the maximum water absorption and life from the planks. Prepare the grill for direct cooking over a medium heat. Place the soaked plank over the direct medium heat and close the lid. After 5-10 minutes, when the plank begins to smoke and char, turn the plank over. The planks can be reused 4-6 times providing they are always soaked well prior. Light up your BBQ for medium direct heat. Whilst you are waiting for your BBQ to warm up, cut the salmon and chorizo into chunks. Layer the salmon, tomato halves, chorizo and olives onto the kebab sticks. Drizzle over the oil and season to taste. Leave to cook for 10-15 minutes. Enjoy your smokey, juicy kebabs.